What it is: A QI huddle is a high engagement, short problem solving exchange with staff closest to the residents and other clinical and operations leaders (for implementation guidance and how-to’s, please visit Pioneer Network’s web-based Starter Toolkit and newly released Implementation Handbook for Engaging Staff in Individualizing Care). Why it is important: Staff closest to the resident can share frequent, timely, accurate problem-solving information to aid the care team in finding effective individualized interventions. How did QI huddles help Mary? Scenario: At shift huddle, the night CNA shares that Mary was in pain during toileting and as she was getting out of bed. The nurse notes that Mary does have chronic back pain due to arthritis and the CNA says it’s worse than usual. They decide to start her on a low dose pain regime with close monitoring. Staff agree to team up for any assistance Mary needs in transferring so that they can give her extra help until she feels better. During the day, Mary’s CNA notices that she seems more disoriented. They’ve all noted that she has not eaten well for the last 24 hours. The nurse says these observations seem like more than pain, and asks everyone to keep an eye out for any further signs and to work together to assist Mary, while they run some tests stat and get to the bottom of it. By the evening’s huddle with night staff, Mary is being treated for pneumonia and a UTI. Given her nighttime schedule, they work with dining to assure an evening snack and drink. When the management team rounds the next morning, they get an update from staff on Mary’s condition and review what everyone needs to know to keep her comfortable and get her through it. Without QI Huddles: Without QI huddles, Mary’s pain and need for increased assistance are not noted and discussed until the assessment after Mary falls a few days later. She is more likely to experience avoidable declines that occur because of delays in addressing her pain and dehydration (that were identified in the scenario above by CNAs that know her well through subtle cues in her behavior). The clinical team meets in the Director of Nursing’s office the next morning to review and act on the 24 hour report. They have no information about Mary’s past few days. One of them will go talk to the staff to find out what happened and then they’ll decide tomorrow on an intervention. In this process, an intervention for Mary will not maximize the collective knowledge of the team. 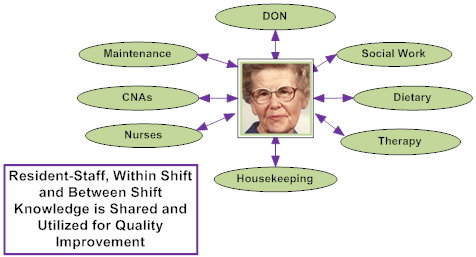 Root cause analysis is less likely to be effective, because important resident preference and customary routine information is not incorporated into the intervention.